In our mid-September post we asked Can You Spot the Monarch in the Crowd? The great news is that a few are being spotted here now! In our yard we saw two the first of October and two more yesterday. 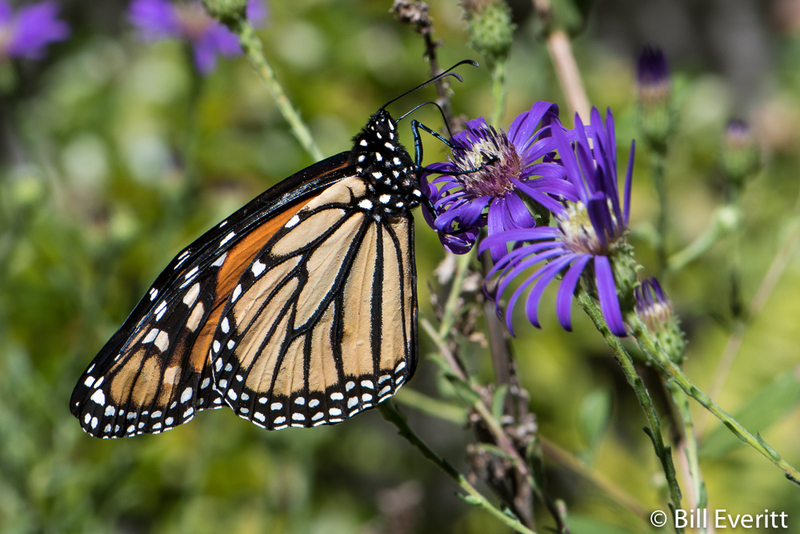 The photo below shows a monarch on a Georgia Aster, both stunning beauties in need of your help. Georgia Asters bloom in October and November providing food for pollinators. They are perennials with woody stems up to 3 feet tall, have thick, dark green leaves and purple flowers ranging from dark purple to lavender-violet to dark reddish purple. This entry was posted in Bees, Butterflies, Fall, Pollinators and tagged Black-eyed Susan, Georgia Aster, Goldenrod, Monarchs, Native Bee, Native Sunflower, Pineapple Sage on October 9, 2016 by beveritt.